Cores are completely disassembled and all external components (housings, front covers, end caps, etc.) are cleaned. Internal wear parts are manually washed before the inspection process takes place. All components are inspected using a variety of instruments and visual methods to ensure accurate qualification. Every component part is pre-certified for the next process. If the part doesn’t meet the required tolerances then a new part will be installed in its place. 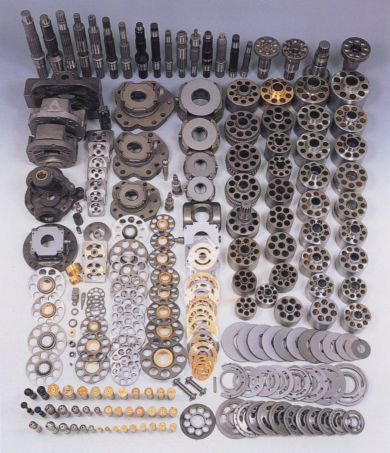 Plates, cylinder blocks, pistons, mechanical shaft seals, slippers and end caps are lapped to remove all wear marks and ensure perfect flatness of surface. The final phase in this process is inspection to verify that these processed parts are within OEM specification or better (one millionth of an inch flatness). All control valves; charge pumps, rotating groups, shaft seals and manifold blocks are pre-qualified and reassembled. Swash plates are assembled and running neutral is dialed in to ensure complete control of the pump when installed back on the machine. Final assembly of all units is made to the customer or inventory requirements. All units are tested and verified against factory specifications. The pump and motor are tested together to ensure the “system” works properly. This test includes checking that the pump returns to running neutral and the relief valves are set to the factory specs. After the initial test is completed, all units are subject to a case pressure test to ensure all gaskets and the shaft seal are sealing properly. The unit test specifications are then recorded by model and work order number and maintained on file. Before the remanufactured pump and motor can be installed on your machine there are certain steps that have to be taken to ensure your system is clean and ready. A complete flushing of all lines, reservoirs and valves must be performed. All remanufactured units are shipped either on a pallet or on a custom built “dogsled” cradle to ensure no damage takes place during shipping. Careful packaging by the Hydratec shipping department means that the units will be ready to go when it arrives at the final destination. Our goal at Hydratec is to have you up and running as soon as possible. We have a large inventory of hydrostatic pumps and motors in our inventory “ready to ship” the same day.